Selena Thinking Out Loud With Purpose had the opportunity to test the Neutrogena Hydro Boost Water Gel in a recent Influenster campaign. Since I was actually looking for a permanent moisturizer to complete my morning skin cleaning routine, I was open to giving it a try. In the video review and demo below, I shared my own personal experience using Neutrogena Hydro Boost Water Gel after 7 days and counting. Since the video review and demo above, I am still using Neutrogena Hydro Boost Water Gel. I have decided to make it my permanent moisturizer since I didn't have one that I really liked. It continues to work nicely on my days with and without makeup. There are no blemishes or unwanted changes to my skin. I do make sure to apply enough on my face and neck to cover my dry areas that I also mention in the video above. The product holds up all day and well into the night. I have been using it daily now, so I have gotten used to it as apart of my daily, morning, routine. I'm happy with it! My face looks fresh, alive, supple, and continues to have a natural glow even after a hectic, busy, day, rushing around town in traffic. I would recommend this product to anyone who is looking for a new moisturizer. Give it a try. It may be just right for you also. Here at Selena Thinking Out Loud with Purpose I tried a new meatless product brand called Gardein. Being a vegetarian, I am always open to trying new meatless products. It makes my life a whole lot easier with quick meals, which is what I have to prepare during the week. I enjoy cooking from home so when I can whip up a healthy, fresh, seasoned, wholesome, meal, I am all in! 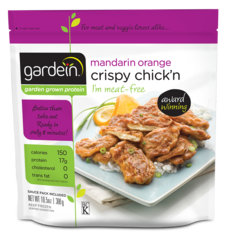 I tried three of Gardein's meat-free products and have my personal review of each below. I did have the opportunity to try a free Gardein product with a free coupon I got free as a BzzAgent as well. In the following YouTube video, I share the BzzAgent Unboxing and what were some of my experiences eating the Gardein Chipotle Lime Crispy Fingers and their Mandarin Orange Crispy Chick'n. Then I review another Gardein product below the video as well. If you would like a coupon to SAVE $1 on any Gardein product, read below a little further for those details. Happy Eating! 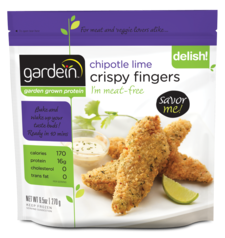 This was the first time trying the Gardein Chipotle Lime Crispy Fingers. I could taste the lime accentuating these meatless fingers but I didn't notice too much of the Chipotle though. They are small, but the serving size of two was actually just enough because they do have that lightly-breaded Chipotle, Lime, breading. It was a meatless, food item I never thought that I would purchase, but they are fast to prepare in the oven on 450 degree for 20-25 minutes and they come out crispy, but be careful to oil the pan a little bit so that they don't stick. They brown pretty quickly so monitor them halfway through baking. I did prepare these with some grits and it really turned out to be a pleasantly-satisfying dinner for me. I will buy them again because they are fast and easy, taste fresh, and meatless with a nice lime flavor. I bought them at Kroger (Ralphs) for about $3.49, so that's reasonable. I just happened to pick up a bag of Mandarin Orange Crispy Chick'n, when I was shopping at Kroger (Ralphs). I was looking for something really quick that I could prepare and feel full after I ate it. I decided to prepare the entire bag so that I could reheat any leftovers the next day. I put a little olive oil into a frying pan and then the meatless chick'n. They gradually brown on medium heat and I turned them frequently because they do brown very quickly. However, I wanted to make sure that they were cooking thorough. I noticed a packet of Mandarin Orange sauce inside of the package and I put it into some warm water until it thawed, according to the package instructions. Once the sauce was ready, I opened the packet and combined it with the chick'n and it quickly affixed together to form an attractive looking orange chick'n. If I wasn't a vegetarian, I would have thought that they were from an Asian take-out restaurant. They tasted great too, like a restaurant-prepared, crispy, orange chicken. I would recommend taking them off of the stove as soon as they are finished combining with the orange sauce to avoid overcooking the meatless chick'n, but they were nice. I had them with some brown rice and it was definitely filling and I was satisfied. I will most likely buy this one again also. They cost the same as the Crispy Fingers so, nicely priced. Wow! These were fantastic to be meat-free. 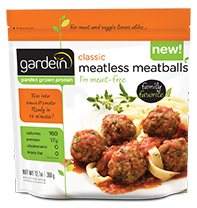 I have tried a lot of different veggie burgers and another brand of meat-free meatballs, and these are much better. They have a nice flavor. The size of the meatballs are worth the money. I believe that I paid around $3.49 for them at Kroger (Ralphs) and they went SO well with a side of freshly-grown, green beans I bought from the produce section. They heated quickly within 20 mins of being put in some tomato, pasta sauce. Since I have not always been a vegetarian (I converted in the year 2000), I can compare these to hamburger meatballs and say that they have a very similar consistency and texture. When I bit into them, they were flavorful and meaty as if they were not meatless. I believe kids, friends, and meat-eaters would like these if you didn't let them on to your secret. Since I have been a vegetarian now for 14 years now, I see how much meat-free foods have improved and these are a great example of this. I would buy them again for sure. I could also do meatball subs or a nice spaghetti pasta with sauce too! I like having different options. Want a SAVE $1 Coupon on Any One (1) Gardein Product? To receive one FREE SAVE $1 Coupon, just send me a message with your *mailing details in the form, on my blog, HERE! If you enjoyed this blog post for Gardein brand Meatless products, share it using the social media buttons below! Selena Thinking Out Loud With Purpose would like to invite you to learn more about Neutrogena Hydro Boost Water Gel in this Influenster Unboxing. I had the opportunity to test this product and can't wait to give you the inside scoop on my experience! For now, learn more about what this product is and can potentially do for you, in this YouTube Unboxing Video! Thank you everyone who participated. See below for the official announcement on the Rafflecopter Form. Selena Thinking Out Loud With Purpose has teamed up with blog, The Old Folks Know Best, to bring you this Jackpot Candles Giveaway! It's always a pleasure to find products that really make a difference in your life. When it's time to get cozy after a long day of work, school, or with a good book, a candle can really make a big difference to the senses. Let's not forget, set the mood too! In this YouTube video below, I share my personal review about my Jackpot Candles experience. The next section provides all of the information you need to participate in The Old Folks Know Best Jackpot Candles Giveaway for one (1) lucky winner. Good Luck! Enter this giveaway using the Rafflecopter Entry Form provided below. (You may use your most used email address or your Facebook account to enter) All entries are optional. Disclaimer: Selena Thinking Out Loud With Purpose worked together with sponsor Jackpot Candles to review a candle and jewelry of their choice. The video review is 100% the personal opinion of this blog. The giveaway is hosted by The Old Folks Know Best and the winner will be contacted by that blog, via email, for mailing information and jewelry selection preferences. This blog is only a promoter of this event.